Melmoth's Inferno: Who framed Billy Blogger? 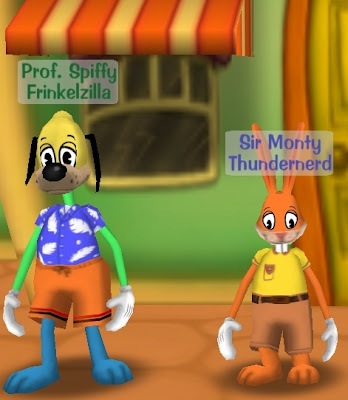 Inspired by Van Hemlock's Operation Cheapseats, and with Zoso pointing out that a cartoon MMO does in fact exist in the form of Disney's Toontown. Your intrepid explorers of other worlds set out to investigate the three day trial of this epic MMO. You'll note, as per my frequent lunatic diatribes on limited choice in avatar customisation, I took full opportunity to display the most keen fashion sense. The bright blue legs, green arms and yellow head look is going to be big this season, just watch the catwalks. Also, suggestions that there may be an "l" missing near the beginning of my forename can't be entirely discounted.